Nearly 19,000 feet above the ground, the wind rips through an open door so viciously that it is strong enough to knock Jennifer Martin to the floor of the aircraft she is in. Her heart is beating so hard, she can feel it thump through her bright pink skydiving suit. Seconds later, Martin, along with 117 other women dressed in blue, purple and teal suits, makes a leap. More than three miles above Paris, Calif., the skydivers float into a flower-like formation staring down at the city. 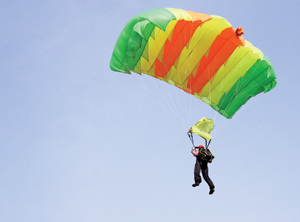 Martin, an avid skydiver, has been jumping since she was 16, and has made more than 4,000 jumps in her lifetime. But she never thought she could make a career out of her hobby. Combining her love for skydiving with her early interest in sewing, Martin started creating skydiving suits for friends. Today, her Milwaukee business custom designs skydiving suits for people all over the world. In fact, all 118 members in a 1999 record-setting jump wore suits made by Martin. When you are considering careers, look no further than your hobbies and passions. Imagine getting paid for something you would do for free. That is what your career can — and should — be like. When John “Hondo” Hughes decided to turn his hobby into a career more than 15 years ago, it didn’t happen like magic. The amazing Hondo, a wizard magician, left his job as a high school teacher to pursue his love of magic. He walked door-to-door to local businesses, introducing himself to secretaries and receptionists to attract “bigger and better work” for his performances. “I would do a couple of tricks for them, and they would go and get their bosses,” Hughes said. “I would put on a little five-minute demo show and just blow their minds,” he added. Long before Hughes started knocking on doors, he studied endless hours to perfect his hobby. For five years in high school and college, he taught himself the art of sleight-of-hand magic (up-close magic) by reading books and practicing endlessly in front of a mirror. He got paid $10 for his first show when he was 16. For nine years after his undergraduate studies at Winona State University, Hughes performed magic in front of churches, schools, companies and organizations as a side job. So when it came time to turn his hobby into a career, he was ready. In his 16 years as a professional magician, Hughes has found the bigger and better clientele he was looking for. He has performed for Muhammad Ali, Joe DiMaggio, Dr. Julius Erving and the late Dinah Shore. He even has performed backstage for Bruce Springsteen and the E Street Band in Chicago. Hughes, who travels the country performing, has seen the groundwork pay off. “I was a magician, but I wasn’t going to make a living because I was a good magician,” he said. “I was going to make a living because I was a good salesman of my magic. “You learn fast that if you are going to make it on your own, if you want to survive, you have got to hustle. You have got to do what it takes to make it,” Hughes said. Ken Mauer grew up loving sports. When he took a one-credit college class in refereeing, he never thought it would result in his progression to a career as an NBA referee. But as he got into it, he grew to love his hobby. Just as Martin and Hughes started small, Mauer started refereeing on the sixth-grade level. He worked his way up to Varsity B-squad games and junior varsity college games. By the time he was 21, Mauer was younger than many of the varsity college athletes he was refereeing. And at age 24, he received his first big break. Having been invited to an NBA training camp, he then found work on the minor league level, refereeing CBA games. After 14 years of refereeing on many different levels, Mauer became the youngest NBA referee at age 30. The long road to the top of his profession was well worth the wait. Taking one of your hobbies and turning it into a career is not a simple process. It takes a self-starter and motivated person to make it work. But more than anything, Martin, Hughes and Mauer all had the love needed to fuel the drive. So take a look around and explore what career options are out there that align with your hobbies. Be imaginative and creative. Talk to people in those careers to see if they match your interests. If it doesn’t work out, you will always still have your hobby.